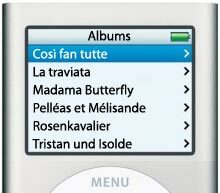 The iPod is ideal for listening to operas on the move, or on long journeys. It works brilliantly with pop music, but if your preference is for classical music, you need to do a bit of work to make it work in a streamlined way. This article describes one recommended approach, based on several months' experience of using an iPod. The Artist field has been set to "Angela Gheorghiu", the main singer on the disc, but probably not the main artist of interest for a classical work. The Album field has been set to "Madama Butterfly", which is fine unless you have two different versions of the opera in your collection, in which case the tracks will get muddled up. 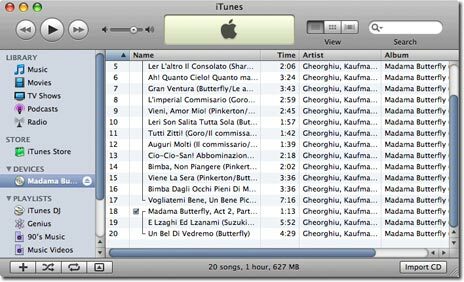 The individual tracks have been imported as separate files, named after the aria at the start of each file, which makes for a confusing display in iTunes. The database iTunes uses to get disc information (called Gracenote) is very inconsistent in its labelling of classical music. If you keep to the default labelling your music library will be a mess. Another problem with leaving the tracks as separate files is that, with the MP3 format, a noticeable gap can occur in continuous music between files. Now import the CD. Each act will now be imported as a single, continuous track. Set Artist to the composer name; eg "Puccini". Set Album to the name of the opera. 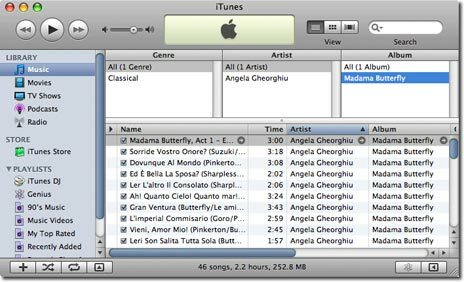 If you have more than one version of each opera, add the conductor's name in brackets; eg "Madama Butterfly (Pappano)". This will distinguish versions of the same opera. Set Name to the name of the opera followed by the act number; eg "Madama Butterfly Act 1". If an act is split over two discs, name the first part "Act 2a" and the second part "Act 2b". 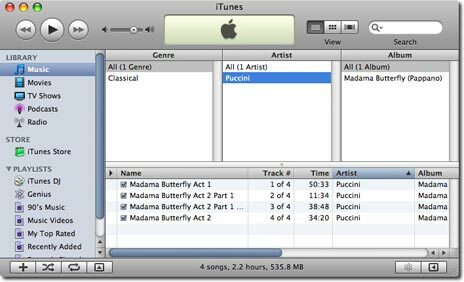 The reason for including the opera name in the track title is that when you are stepping between tracks on an iPod Shuffle 3G, VoiceOver reads the track name followed by the artist, so you'll now hear "Madama Butterfly Act 1 Puccini", "Madama Butterfly Act 2a Puccini", etc. Finally, number the tracks consecutively eg 1 of 4, 2 of 4, etc. This will ensure that the tracks play in the correct order. Note that I've chosen to show the track number in the iTunes window. Remember to sort by Artist before uploading the music to your iPod, or the tracks will play in the wrong order.